The Headless Horseman of Loantaka Reservation has been seen lurking along a bridge crossing waiting to lash out at those who dare to approach this mysterious ghost. You must make contact with the headless horseman, and convince him to give you the coordinates to the final resting place of his stash! NOTE: please see final coords under clue. The legend of the headless horseman has appeared in many forms of literature throughout history and throughout the world. 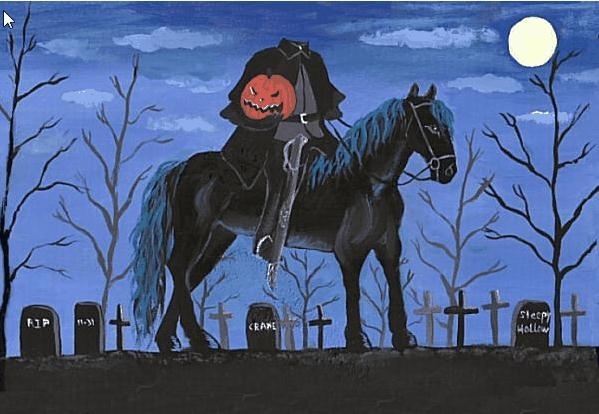 Many countries have their own unique version of the legend in which some form of the headless horseman appears. The most recognizable headless horseman is the one that appears in Washington Irving's short story, which was published in 1819. The story is set in America, within a 1790's Dutch settlement that residents nicknamed “Sleepy Hollow”. Its protagonist is a schoolteacher named Ichabod Crane, whose apparent demise results from a meeting with the horseman. The horseman himself is allegedly a Hessian soldier from the Revolutionary War who was decapitated by a cannonball and now roams Sleepy Hollow on the back of his horse, with his severed head resting upon the pommel of his saddle. He is therefore also called the 'Galloping Hessian'. The Horseman is said to be incapable of crossing the bridge at the town entrance (a possible reference to the belief that ghosts cannot cross water), although he is shown throwing his head across a river to strike down Ichabod Crane. Ichabod's fate is left ambiguous; some of the background characters allege that he has been "carried off" by the Horseman, while others suggest that he has been frightened out of the county by the ghost and by the prospect of facing his landlord, later to become a lawyer in Philadelphia. It is implied later that the Horseman was in fact Brom Bones, Ichabod's rival for the hand in marriage of the local beauty Katrina van Tassel, who imitated the legend of the Galloping Hessian on purpose to kill or frighten away his competitor. The fact that a shattered pumpkin is found beside Ichabod's abandoned hat supports this, in that the pumpkin may easily have been used to simulate the Horseman's severed head. Intriguingly, there is no mention of a severed head in the story heard by Ichabod, though it is prominent in his own encounter with the horseman. —Washington Irving, "The Legend of Sleepy Hollow"
onfr bs gerr...fbzrguvat irel uneq!